As a child I was always told to drink milk. My babysitter would always make me drink the milk out of my cereal or drink a glass of milk with my bagel. She always said that I needed to drink milk everyday to make my bones strong. Milk is calcium rich but we can get calcium from other food we consume. The real question is: is milk truly important? 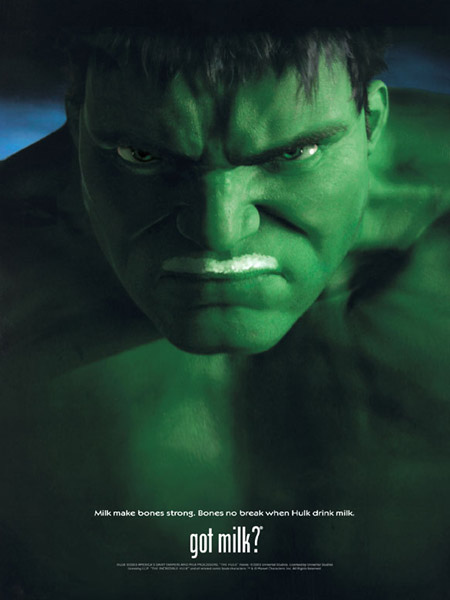 If you would search for milk images on the internet, you would probably find a hundred images with seemingly endless celebrities with milk moustaches, known as the “Got Milk?” campaign. It was an ingenious way for the dairy industry to push the importance of milk in our diets. But, is milk a necessary staple in our diet? This blog is not to argue the merits of whole milk versus non-fat milk nor raw milk vs. pasteurized milk. This blog seeks to reveal the true merit of drinking milk, whatever type, at all. Obviously, milk is essential in the early stages of mammalian growth and development. In fact, the primary characteristic of mammals is the presence of mammary glands to produce milk for their offspring. One important feature of all non-human mammals is that they suckle their young until they are able to become independent (able to eat solid foods). This varies between each mammal with some mammals such as the hooded seal nursing for four short days, while others such as the orangutan may nurse up to seven years! But what does that mean for humans? In the United States, women receive conflicting advice about when to wean their children completely from breastfeeding. The American Academy of Pediatrics recommends one year, while WHO and UNICEF recommend at least two years. No matter the duration, what benefit, if any, is there to consuming milk after the weaning process? 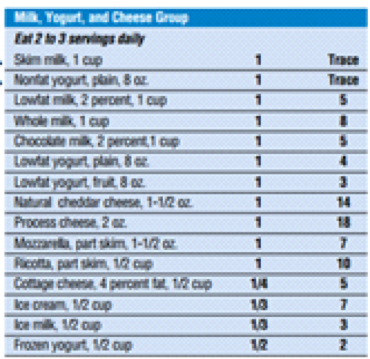 According to the Food Guide Pyramid, published by the USDA, humans should consume 2-3 servings of dairy (milk, yogurt, cheese) every day, as we see in the photo above. Why? The USDA says that milk and milk products are the best source of calcium, which helps build and maintain strong bones, preventing osteoporosis. But if milk is so important in receiving the required quantity of calcium for healthy bones and preventing osteoporosis, why do mammals stop producing milk? Whenever calcium is lacking in the diet, it is pulled from the bones temporarily, until it can be replaced. But this is not what causes osteoporosis later in life. During the aging process, bone is lost naturally. However, if calcium is consumed at high rates early in life, the amount of bone density lost as we age is reduced. The uncertainty occurs because studies have not yet determined how much calcium is needed to build optimum bones and teeth. Long term studies suggest no correlation between high calcium intake and a reduced risk for osteoporosis. In a large Harvard studies of male health professionals and female nurses, individuals who drank one glass of milk (or less) per week were at no greater risk of breaking a hip or forearm than were those who drank two or more glasses per week. Additionally, when researchers combined the data from the Harvard studies with other studies, no association between calcium intake and fracture risk could be established. American adults may not need as much calcium as is currently recommended. In countries such as India, Japan, and Peru the incidence of bone fractures is very low despite the fact that they take in less than a third of the U.S. recommended calcium intake (for adults, ages 19 to 50). According to this Harvard milk study conducted by David Ludwig, a professor and pediatrician, milk is only one of many sources of calcium. Calcium can be found in other food sources such as dark leafy green vegetables and some types of legumes. And though the dairy industry boasts the calcium-rich content of milk, studies show that we may need less calcium in our diets then once thought. And if that is true, the calcium we get from a diet rich in green leafy vegetables and legumes may be adequate. So is milk truly necessary in your diet? Well in my research I found that it is extremely helpful but maybe not as necessary as we are made to believe. Would I advise one to stop drinking milk based on these findings, no. Milk mustache to your hearts content! Dettwyler, Katherine A. “A Time to Wean.” La Leche League International. N.p., 14 Oct. 2007. Web. 3 Oct. 2016. Harvard T.H. Chan School of Public Health.” The Nutrition Source. N.p., n.d. Web. 03 Oct. 2016. This entry was posted in Uncategorized on October 3, 2016 by Alexis Paige. One of my friends back at home is a musician. She sings and plays the guitar. She told me that her voice coach advised her to stop drinking milk and eating dairy products because it causes flem to build up in the back of her throat and it could affect the quality of her voice. She hasn’t consumed any type of dairy product for over a year now. Like you said in your post, there are other ways to include calcium in your daily diet besides dairy products, and that exactly what she does. She does not consume calcium on a daily basis. She has also never broken a bone, which goes along with the point you were making in your post. I always assumed I needed to drink more milk to have stronger bones just because that is what I was taught. I stopped drinking milk right after I was weaned off of breast milk, so my doctor has always been concerned with my low amount of calcium intake. She has told me to eat cheese, other calcium-rich foods like you mentioned like spinach and even eat ice cream to compensate for my lack of milk consumption. So it would seem from what my doctor informs me that it’s not milk that’s important but calcium. Your point about female mammals stopping their production of milk is interesting but I don’t think that is proof that milk is not necessary in your diet. I think that may be because older mammals do not need to be breast fed, as it is impractical for an older mammal to get an adequate amount of milk from a female mammal since they need much more nutrients than a baby does. According to this study that was published in the Journal of Dairy Science, many studies have shown that the chance of getting osteoporosis is significantly reduced with the higher intake of calcium and the other nutrients found in dairy products. This is why 3 servings of milk is recommended to help build strong bones and decrease health risks. This study also stated that when they analyzed 139 scientific papers on the effect of calcium intake on bone health that were published from 1975 to 2000, 50 of 52 “controlled intervention studies” showed that calcium had a positive impact on bone health. This seems to contradict the findings of the Harvard study, but I would definitely need to do much more research to come to any sort of full understanding as to the differing of results. It seems like there’s a lot of published research done on this topic, but from your blog post and from what I read researching as well I think I would come to the same conclusion as you—milk is helpful but not necessary. What does seem to be pretty necessary is calcium and the nutrients found in milk, but as long as you find those nutrients elsewhere you’ll be ok. This post is cool because its such a relatable topic. Growing up my mom always made me drink milk for the same typical reasons every other parent made their child drink it: the health benefits. As I adjusted to college living I realized I barely drink any milk here. 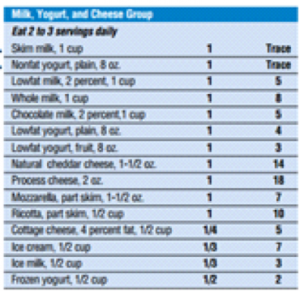 Its so conflicting to know that each day you need a certain serving of dairy, yet just as many people say dairy is bad for you. It may have health benefits but too much can be bad for the body. Lots of people do not eat any dairy as a diet and they seem to be okay as of now ( there could be downsides down the road). I cannot tell you how many times my dad used to make me drink the milk from my cereal bowl when I was little, and how much I hated it. Milk alone was always something I despised .The fact that I grew up with this limited knowledge that focused on milk being the only way to strengthen my bones makes me kind of upset. I have heard recently, though, speculations correlating to your blog. Especially since vegan and paleo diets are trending now which include the alternatives for milk with almond, coconut, soy, cashew, and even hemp milk. It makes me question, are these equal replacements to the important nutrition supplements in milk? This article gives great insight on almost all dairy milk replacements including some of their nutritional facts. For example, a very common and popular alternative used today is almond milk. According to the article in medicalnewstoday.com, it has significantly lower calories and fat than dairy milk, but also lacks in some more essential nutrients such as calcium and vitamin d. Mentioning dairy milk replacements might be something to consider in your blog. Also, I think your information is well constructed but you need to site your sources periodically throughout your blog. Other than that, this is a very interesting and easy to read topic! I love this post, especially because you highlight that milk is not the only source of calcium available to us. I grew up basically living on milk, I had it with every meal. However, as I’ve gotten older I’ve become less and less interested in drinking milk, and I primarily stick to water, orange juice, and coffee. Actually, where I used to drink milk, I now substitute with almond coconut milk. A lot of my friends question why I would stop drinking milk, since it is in fact a great source of calcium, but I believe they are biased towards what they grew up with, the misguided concept that milk is the ONLY source of calcium. I found a pretty nice article on USA Today highlighting all of the alternatives to regular milk. Check it out if you have some time! I think this post is very well done! I think your point about mammals not producing milk after a certain point is such an interesting concept that I have never taken into consideration. I also think we may grow up to think milk is such a vital diet staple because, as babies, we don’t have other options for calcium. No baby or young child is going to eat broccoli, cheese, or tofu. I think nowadays with the new vegan trends among young people, milk is becoming less and less of a diet staple for no other reason than the fact that it isn’t trendy, in my opinion. Here is an interesting article regarding the importance of milk… note that it comes from a website called “milk.co”, so clearly whoever wrote it is quite biased. Had it come from a vegan website, we would see a whole argument about why milk is useless. Before reading your post, I read the diet coke one and immediately connected the two. The intake of milk has drastically decreased while the intake of sugar drinks increases daily. I feel that in the past most thought milk was the only good thing for your health because that’s all they were exposed to. Now with new technology, our generation feels that there are new drinks with just as much good proteins as milk but that is false. http://www.livestrong.com/article/474859-what-are-the-benefits-of-drinking-milk-vs-soda/ this is an article explaining the different benefits of drinking milk v. soda. I found it very interesting and I think you would too! I found this blog interesting since I am an advertising major and have often seen the “Got Milk?” ads on TV but never fully understood why milk was seemingly forced upon us. I too, as a little kid, was urged to drink milk as much as possible because it builds strong bones and healthy teeth. It’s interesting to learn that today studies are showing that milk may not be as necessary as people once thought it was. I do agree with you in that since there are no harmful effects of drinking milk, people should not change their diets because of these studies. However, it may be helpful for people who are lactose intolerant or vegan to know that they can get their calcium servings from other food products such as leafy green leaves and legumes. I personally am not a big milk drinker so I get calcium from vitamins and other dairy products such as cheese and yogurt. I do think that if another food product decided to market themselves as being high in dairy that the milk industry could potentially enter a decline in sales. All in all, an interesting post! Great post, Alexis! I liked this blog because I feel like nowadays so many people have cut dairy out of their diet however, I haven’t heard of people being calcium deficient. I think it’s interesting to see how there are so many other ways to get calcium, but the dairy industry just took over the scene through marketing. I wonder if another food product were to do this, would their sales go up and would dairy become less popular?